Brown meat in a large pot (cook completely until no pink remains). Drain. Stir in celery, garlic, onion, green pepper, salt and pepper; cover and simmer about 10 minutes until vegetables are tender but not soft. You can use this mixture immediately during your cooking session or freeze in two-cup portions for later use. Tacos: Add one package taco seasoning to two cups All-Purpose Ground Meat Mix (follow package directions for amount of water). Freeze. To serve: thaw and heat taco mixture; prepare tacos as you would normally. Taco Potatoes: Follow instructions for taco mixture (above), but serve the mixture over baked potatoes instead of tortillas or taco shells. Top with grated cheese, diced tomatoes, sour cream, sliced green onions, sliced black olives and salsa. Easy Taco Salads: Follow instructions for taco mixture; place a layer of corn chips or tortilla chips on plate; spoon taco mixture over chips; add layer of shredded lettuce; add diced tomatoes, sliced green onions, sliced black olives, sour cream and salsa. 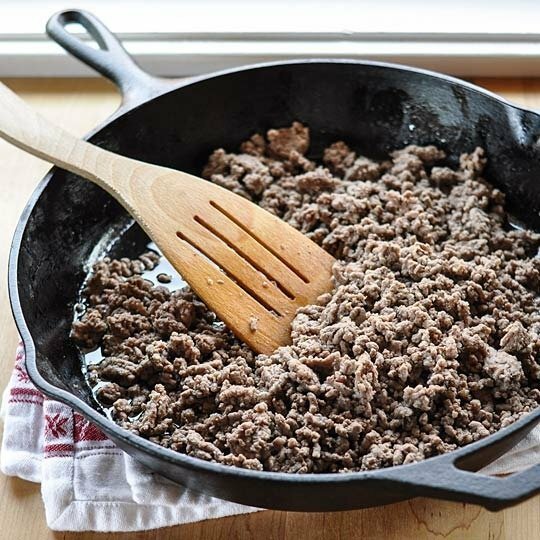 Sloppy Joes: In a large skillet, place two cups Ground Meat Mix, one (10 3/4 ounce) can tomato soup, two tablespoons brown sugar, and one teaspoon prepared mustard. Stir. Cover and simmer ten minutes. Serve ladled onto hamburger buns. Can also be used for: Stuffed Peppers, Chili, Spaghetti, and Baked Ziti (further recipes can be found in the Frozen Assets book).